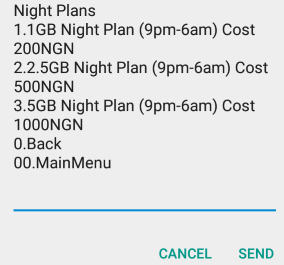 MTN Nigeria has got various night plans for her customers depending on how much data you need. This Night plans from MTN is indeed affordable as you can get 5GB for 1000 Naira and 500 MB for 200 Naira. The full list of the MTN Night plans and their respective subscription codes can be found below and they are all valid for 30 days. 3. You will now be provided with options as seen in the screenshot above, just reply with the number that corresponds to your choice plan to complete the transaction. Make sure you have sufficient airtime before dialing the codes.